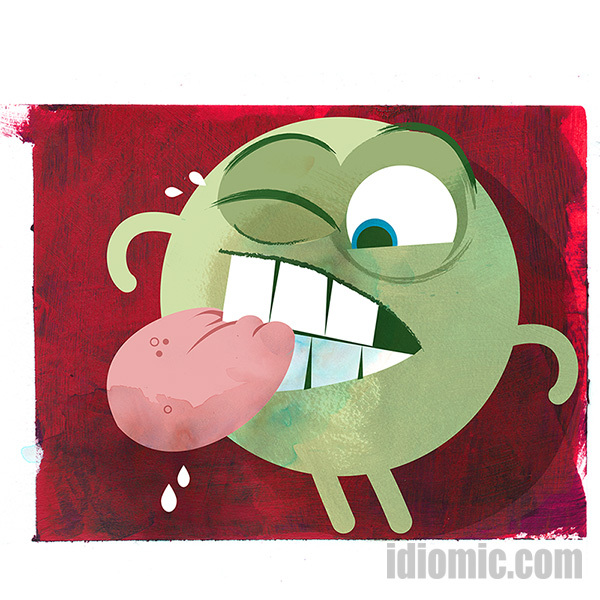 'Bite your tongue' illustrated at Idiomic.com: defintion, example, and origin. Definition: Be quiet! Don’t say that! Example: Hillary wanted to tell Donald what she really thought of him, but instead she bit her tongue and kept quiet. ‘Bite your tongue‘ is a popular phrase originates at least to the time of Shakespeare. He used a variation of it in Henry VI. It is supposed it refers to the fact that if you hold your tongue between your teeth, it is impossible to speak. Alternatively, perhaps it is a proposed form of punishment. Say something nasty, and you should be forced to chomp down. After all, biting your tongue is extremely painful. “Hold your tongue” which has the identical meaning. ‘Hold’ in this instance means to stop, not to literally take hold of it. “Wash your mouth out (with soap)” for when somebody has used profanities. Iddy has had his fair share of having his mouth washed out over the years. A mouth that big is bound to get you into trouble….